City Theatrical will be demonstrating some innovative technology at Prolight + Sound in Frankfurt, Germany on March 12-15, 2014 (Hall 9.0 Stand C54), including QolorFLEX Professional LED Light Tape, D Series LED Dimmers, the SHoW Baby 5 wireless DMX transceiver, and the Cognito Lighting Control Console from Pathway Connectivity. Also being demonstrated is City Theatrical’s compete line of SHoW DMX Neo wireless DMX products. City Theatrical’s SHoW DMX is the wireless DMX of choice for lighting professionals on Broadway and West End shows, permanent entertainment installations, architectural landmarks, major music tours such as U2 and Madonna, and large scale events such as the opening ceremonies of the London Olympics. QolorFlex Professional LED Light Tape is aimed at the professional lighting market, including live theatre, television, film and video, and live events. LED tape is a revolutionary product, allowing lighting users to put light in places that were impossible in the past and to create lighting fixtures and lighting effects in new and inexpensive ways. 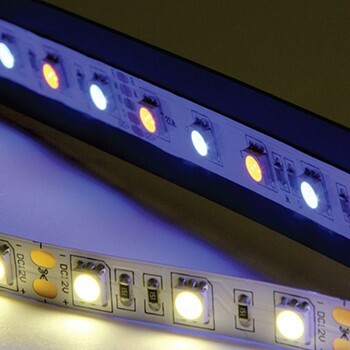 QolorFLEX Professional LED Light Tape is available in a variety of types such as single color, RGB, RGBA, and RGBW. Working alongside QolorFlex Professional LED Light Tape are City Theatrical’s D Series LED Dimmers, sized from the single channel D1 Dimmer up to a high powered four channel D4 Dimmer with a built-in power supply. These dimmers all have the extremely smooth dimming curves that professional shows demand and a range of user interfaces and features that makes setting them up easy for lighting users. Two dimmers in this range also include a miniature SHoW DMX Neo receiver for high quality professional wireless use. SHoW Baby 5 is the latest version of the hugely popular SHoW Baby wireless DMX transceiver. SHoW DMX SHoW Baby 5 is incredibly easy to use and incredibly affordable, while still offering the quality and advanced features of SHoW DMX Neo technology. SHoW DMX SHoW Baby 5 is perfect for the venue or performance where a full featured SHoW DMX Neo system might be too sophisticated or too costly. The SHoW DMX SHoW Baby 5 represents a breakthrough in plug-and-play wireless DMX and RDM transmission - a single unit that can be used either as a wireless DMX transmitter or receiver. Set-up couldn’t be simpler with SHoW DMX SHoW Baby 5’s instant plug and-play configuration: When a DMX cable is plugged into the SHoW DMX SHoW Baby’s DMX Input, the unit senses the connection and configures itself as a transmitter. If no cable is connected to the DMX Input, the unit configures itself as a receiver. All you need now to set up a SHoW DMX wireless DMX system is two SHoW DMX SHoW Baby 5 units and two minutes! In addition, the SHoW DMX SHoW Baby 5 system offers five different SHoW IDs, which allow users to set up a multi-universe system by adding additional transmitters or to use multiple separate SHoW Baby systems in the same area. SHoW DMX Neo wireless DMX technology is the latest innovation in City Theatrical’s 12 years of wireless DMX development and manufacturing. SHoW DMX Neo features the extremely high data fidelity that the multi-award winning SHoW DMX is famous for, as well as incredibly fast 7ms latency, ensuring that wired and wireless DMX sources will appear exactly the same. All SHoW DMX Neo products feature the ability to optimize control of output power, full or limited bandwidth broadcast, and the ability to broadcast less than the full DMX packet to shrink the radio footprint. For users who do not want to manually optimize their broadcast, SHoW DMX Neo products also have Neo Adaptive Mode that will select only open radio channels to broadcast on, with no user intervention needed. All SHoW DMX Neo products will also "heal" lost data packets. Pathway Connectivity’s Robert Armstrong will be in the stand to demonstrate the Cognito™ Lighting Control Console. The Cognito is small lighting console that is perfect for smaller venues and shows. The Cognito utilizes natural language control and a graphical user interface for lighting programming, producing an environment in which even an inexperienced user can quickly learn to program, while still having the rich features a more experience programmer expects. The Cognito lighting console solves the complex task of programming shows for systems that include incandescent dimmers, moving lights and color changing LED fixtures. Cognito is network-ready and features a streamlined user interface to guide you through the process of selecting lights, adjusting their attributes, and recording reference libraries, memories, and cues. Once programmed, the show is played back manually or with sequenced playlists. The Cognito has up to 1024 output channels with no practical limit on the number of memories, cues, or playlists, and its natural language control uses real world terms and values, not channel numbers and DMX values, making operation intuitive for everyone. The built-in fixture library contains over 1,200 commonly available multi-attribute lights from manufacturers worldwide. Context sensitive help is available on every screen by just pushing the "Help" button.